Although most people look forward to the holidays, there are many families in our community who struggle to get through them. For many families, Christmas gifts and turkey dinners are an enormous financial stressor, or maybe even a luxury they cannot afford. Candice and Jeff, who live on a low income while caring for their eight children, two of whom are adopted, know what it’s like to struggle during the holiday season. They moved to Edmonton from Saskatoon 13 years ago after facing threats of violence from Candice’s ex-partner. Although relieved to find a safe place to call home, Candice and Jeff were suddenly alone and jobless in an unfamiliar city with five children and a baby on the way. 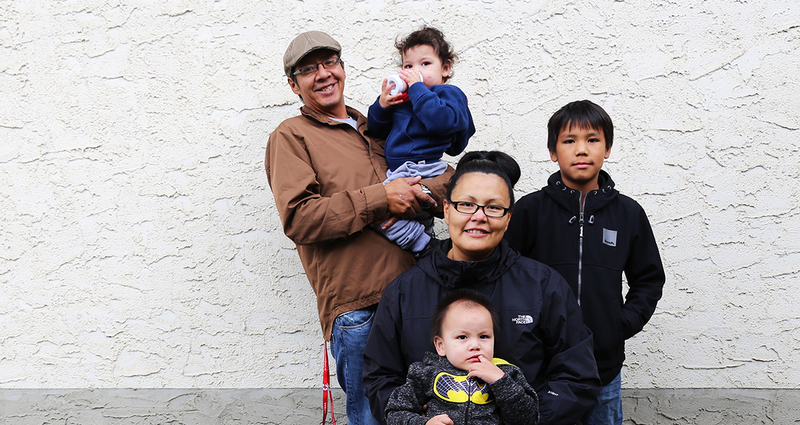 They worried about bringing another baby into the world without the social support they had enjoyed in Saskatoon. Both had plans to find full time work, but knew that working would be difficult while balancing the needs of their growing family. Finally, an acquaintance of Candice recommended Bissell Centre’s free Childcare program. “I remember coming here and at first being a little cautious. It was a little bit scary,” said Jeff, recalling his first visit to Bissell Centre. “But they always told us what to do and where to go when we needed help.” Since that first visit 13 years ago, Candice and Jeff say that Bissell Centre staff have become “like family” to them. Candice says that the resources offered by Bissell Centre were invaluable. Over time, they were able to develop a network of friends after attending various Bissell Centre events, including family barbecues and community outings. Both Candice and Jeff are now planning to pursue higher education: Candice for business administration and Jeff for pastoral leadership. Candice began her full time education in October, and hopes to have her diploma completed in two years. This Christmas, Candice and Jeff are grateful that they will not have to spend the holidays worrying about being able to afford gifts for their children. Bissell Centre’s annual Festive Giveaway ensures that children in need receive a hot meal as well as toys, candy, and warm winter clothing for the holidays, all donated by caring members of the community. Two hundred families like Candice and Jeff’s are expected to attend this year’s Festive Giveaway at Bissell Centre. Please help make Christmas a joyful season for families in need.